Been away for a couple of days and was having so much fun I slipped into a small lapse. Off with Olga at a wedding, which was lots of fun and gave us both lots of ideas. But my usual sarcastic rambling hardly seemed in keeping with the spirit of the occasion. So please don't count these last few days of silence against me. I'm still committed to this challenge. I'll keep writing until 1) Trump caves, 2) they start digging Trump's wall, or 3) they find some face-saving way out that returns me to work. The signs don't look good today. 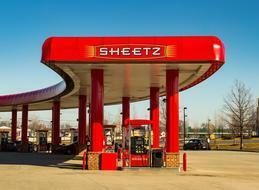 Sheetz - I don't remember Sheetz when I was growing up. I was surrounded by Cumberland Farms, Wawa, and the occasional Piggly Wiggly. They I leaned that Sheetz is in a whole different market. Large, conveniently located at interstate exits so as to attract long-haul truckers and weary travelers. Unlike the convenience stores that I remember, Sheetz is a industrial enterprise churning out hot food and snacks of all variety. But that name! No rumblings about the Federal Highway Administration launching a new set of rules to force a change, which would probably lead to "Pho King Sheetz". 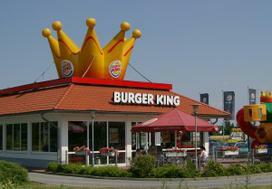 Pho King Burger - Burger King has spent a fortune on marketing. Costumes for the ridiculous king. Television commercials. Toys for the children. Cardboard crowns. Why not just lay it on the line with a tag line that does not invite rejoinder and keeps the commercial to five seconds. 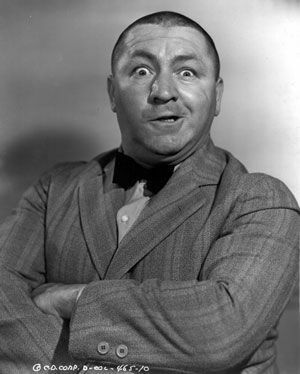 Imagine a full facial shot of the king himself uttering four syllables. "Pho King Burger!" Point taken. Raise your hands - how many of you thought that the Vietnamese word "Pho" was pronounced "Phoe"? Well, it's not. It's pronounced "Phuh", like Elmer Fudd with no "d". And it's gotten a new restaurant in Keane, NH into some hot water just when it was needed. When the glue from the Coming Soon signs was still drying. ​OK, so Pho can be kind of gross. I've eaten it and liked it, but I've had to be very careful what I'm ordering because it tends to be heavily laden with entrails, offal, tripe, and random body parts. I'll admit to showing my ignorance and will stress again that I actually do like the stuff. I just don't like the thought of it. According to the Washington Post, the city of Keane, NH didn't even bother to ask what was in the stew before they turned up their noses. 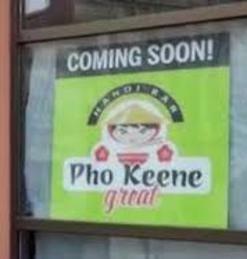 The Post, which has no business in this local story, reports that signs started showing up around Keane promoting the new eatery, which is harmlessly named "Pho Keane Great". Plucky little handle, no? ​Remember that Pho, despite its deceptive spelling, is not pronounced with a long "o". Making Pho Keane Great either a very boastful invitation or a very crude one. The residents of Keane, being of puritanical stock, choose the latter. And the signs, which were posted in City Hall, drew scorn from the City Manager. Things looked like they were winding down after the Pho Keane restaurant owners agreed to take the signs down. But then the restaurant got into a battle of wills with the city, arguing that they were within their rights to say whatever they Pho Keane want in their signage. To settle matters once and for all, the Pho crew did a Facebook survey that found that 3,400 voters did not find the name offensive, while 117 did. Of course, by then the story had gone viral and there's no telling where those 3,400 votes came from. Probably not New Hampshire.